Between 8-24 April, you may need to account for extra travel time and traffic diversions if you plan to park at P3 Long-term Parking or P4 Basic Parking at night. The same goes for staff parking at P5, P40 or P44. That’s because we will be testing the new safety features of the Buitenveldert Tunnel during that period. The tunnel will not be closed every night. However, you will need to account for an extra 25-35 minutes of travel time if it is, depending upon your route. The safety tests will be conducted between 22:00-04:00. The Buitenveldert Tunnel will close to all traffic during these times. That means cars, buses and taxis have to follow a traffic diversion on the A4 and A9 motorways. This will affect you if you want to get to P3 Long Parking or P4 Basic Parking. People who work at Schiphol and use P5, P40 and P44 will also be affected. You can reach your parking place by following the A9 / Exit 6 to Aalsmeer. Please take into account extra travel time. 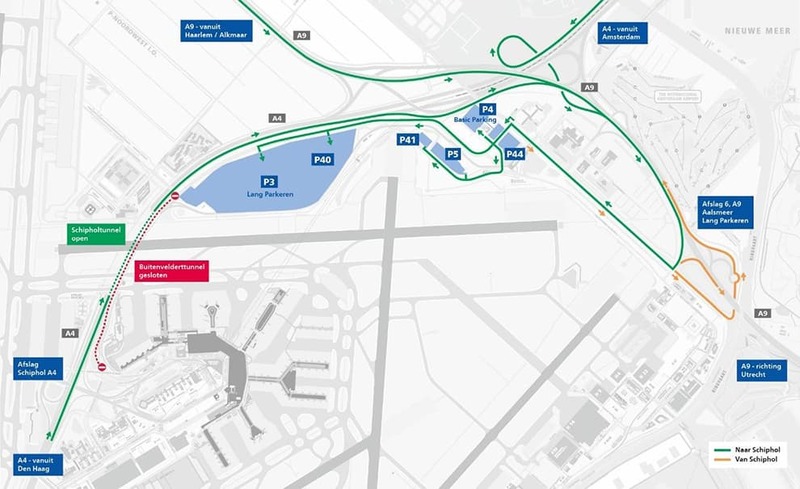 You can use your Schiphol to park at P30 if you arrive after 21:30 and would otherwise risk being late for work. To do so, please register at the intercom upon entry to the parking lot. The Buitenveldert Tunnel has been under renovation for the past two years and now has new safety features. The works are almost complete. From 8-24 April, the new safety features will be tested overnight, which require the tunnel to be closed to all traffic. The Buitenveldert Tunnel is situated on Loevestijnse Randweg, between Schiphol Plaza and Schiphol Noord. The Connexxion buses will take different routes and skip a few stops. However, they will use shuttle buses. Trains to and from Schiphol will not be affected. If you are faced with a traffic diversion, you will find more information along the road and at the various parking areas. You can read up-to-date information about your travel day on our Twitter, on My Travel Day. or at connexxion.nl/bustunnel. From the Badhoevedorp junction, take the A9 exit towards Amstelveen / Utrecht. From the A9, take exit 6 in the direction of Aalsmeer. Then turn right at the traffic lights, and follow the signs that read ‘Long-term Parking’. From the A4, take exit 2 in the direction of Amstelveen (A9). From the A9, you take exit 6 in the direction of Aalsmeer. Then turn right at the traffic lights, and follow the signs that read ‘Long-term Parking’. From Haarlem, stay on the A9 and take exit 6 in the direction of Aalsmeer. Then turn right at the traffic lights, and follow the signs that read ‘Long-term Parking’. We’re sorry that you will need to account for extra travel time during this period when travelling to P3 Long-term Parking or P4 Basic Parking. We’d like to compensate you with a parking discount for your next trip. You can obtain a discount code from the Customer Contact Centre – please have your reservation number at hand when you call.